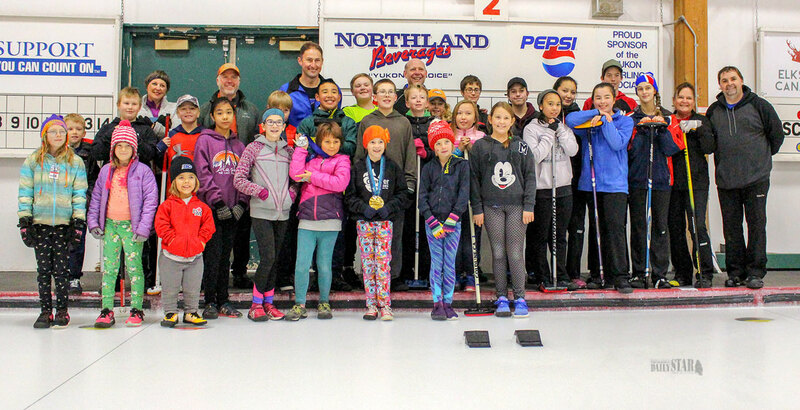 THE JUNIOR CURLERS — After a two-hour instructional clinic, the junior curlers took the opportunity to pose for pictures with Kevin Martin. As well they got to hold his gold and silver Olympic medals. POWER OFF THE HACK — The team Hot Mess is all smiles as they listen intentely to Kevin Martin as he runs them through a technical training session. TAKING AIM — Kevin Martin closely watches the technique of Scott Cameron’s delivery. 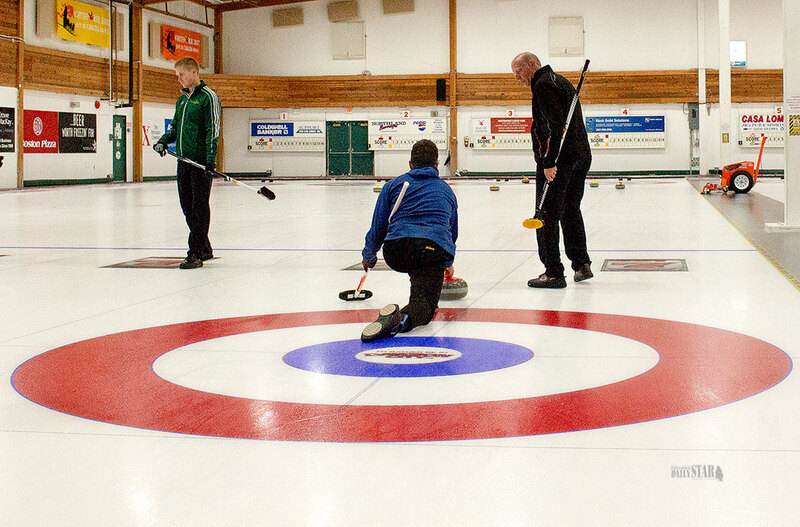 Curlers of all ages and skill levels headed down to the Whitehorse Curling Club Saturday to take part in instructional clinics, lead by three-time Olympian and four-time Brier champion Kevin Martin. The juniors were the first to take to the ice Saturday. Over 24 young curlers listened attentively and stared on wide-eyed as they absorbed Martin’s coaching. Although many of them have only been curling for a few years, they are already looking towards their curling future. Jordan Keats is heading into his eighth curling season and says the instruction he received from Martin is going to help him reach his next curling goal. Griffin Beaudry has been curling since he was six, and is currently curling in the Junior Rockers program. Teams were also able to book individual spots with Martin in order to receive team-oriented instruction in preparation for the up-coming curling season, which begins today. 1 1/2 of private instruction from Martin. Although all experienced curlers there was plenty of learning to do, and some of the team-members could not help but feel a little awe-struck. When learning from a high-caliber athlete, who has competed on the world’s largest stage, the teams tried to get every bit of advice they could during their time with Martin. Lee Malanchuk echoes the sentiments of his two Hot Mess teammates. Malanchuk was most impressed with Martin’s ability to recognize and adjust every curlers technique, regardless of their current skill-level. After the teams were finished with their private sessions there was still time for one more clinic, as over 30 novice and intermediate players joined Martin at the rink. Coaching for another two-hours Martin lead the group through all the nuances of the game, from the different positioning on the hack, broom position when delivering the stone, and sweeping technique. Scott Cameron participated in the afternoon clinic and was extremely impressed with the way Martin handled himself amongst all of the curlers. As the session ended the participants took the opportunity to get their pictures taken with Martin, as well as check out his gold and silver medals. The buzz and excitement generated by his clinics was apparent, as talk of technique and strategy reverberated around the curling club, as everyone eagerly anticipates the beginning of their curling season to put their new skills into action.